We have a 48 hour cancellation policy. Cancellations must be made 48 hours before 10.30 am of the arrival date. No shows shall be charged the equivalent of the first two nights’ accommodation. For August and any booking including 31 December, our cancellation policy is 14 days before 10.30 am of the arrival date. Guests cancelling outside of the cancellation period will receive a 90% refund when booked via the High Street Hostel website. SPECIAL CANCELLATION POLICY FOR AUGUST/NEW YEARS / HOGMANAY: All New Years / Hogmanay reservations must be cancelled 14 days in advance prior to 2pm on the arrival date. If it is less than 14 days in advance, YOU WILL BE CHARGED FOR THE FIRST TWO NIGHTS. OVER 18 ONLY - Sorry, no children. If you would like to book 6 people or more you need to contact us directly before you make the booking. Be aware that if you book for a group your reservation will be cancelled and you will lose your deposit. All guests must provide some form of identification (either passport, drivers licence or national ID card) at check in. FAILURE TO SHOW WILL RESULT IN THE FIRST NIGHT BEING CHARGED AND THE RESERVATION WILL BE CANCELLED. We require a £10 key deposit and government ID must be presented at check in. charged. No shows will be charged the first 2 nights of the booking. Group of 6 or more need to contact the hostel directly before making a reservation - This includes guests making separate / individual reservations up to and over 6 guests. We reserve the right to cancel any unauthorized group booking, including individual bookings made on the spot. You will be charged in full and not refunded. Looking for a fun, cheap, friendly, comfortable, easy-going, historic place to stay in central Edinburgh that caters for backpackers, budget travellers, students, fellow world explorers etc? You found us! 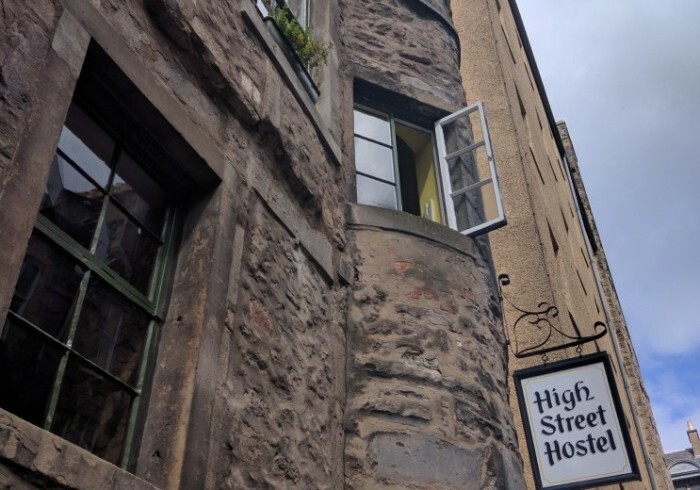 High Street Hostel can provide all you need for a great time in this beautiful city. Open year-round, we offer a gentle vibe with great facilities at budget prices. Situated in a small street off the Royal Mile in the very heart of the Old Town surrounded by all that makes Edinburgh great – THE CASTLE, THE NIGHT- LIFE, THE CITY CENTRE – we are also just minutes from the Train, Bus station, and the Airport bus terminal. As Edinburgh's original backpackers hostel, High Street Hostel has been making backpackers feel at home since 1986. Come and meet our friendly staff, enjoy the history of the building, and check out everything that Edinburgh has to offer.